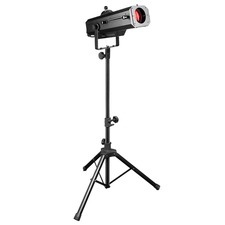 Highlight people at far distances with this LED follow spot. Produces a strong tight beam powered by a bright 120 watt LED. Control either manually or using DMX. Reduce the beam's diameter using the mechanical iris to focus the light where its needed. Ships with a tripod (as shown in photo) to make setup simple.